The RP Photonics Buyer's Guide contains 3 suppliers for fluoride fibers. 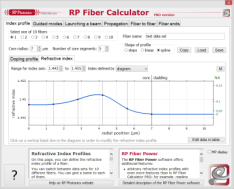 Ask RP Photonics about the design of fluoride fiber lasers. Dr. Paschotta has done extensive modeling of thulium-doped upconversion fluoride fiber lasers. Fluoride fibers are optical fibers based on fluoride glasses, e.g. fluoroaluminate or fluorozirconate glasses. The cations of such glasses are usually from heavy metals such as zirconium or lead. Fluorozirconate glasses (where ZrF4 is the major component) are a typical example, and among them ZBLAN glass (ZrF4-BaF2-LaF3-AlF3-NaF) is the most common. Such fibers can be doped with a number of rare earth ions for application in fiber lasers and amplifiers. There are also indium fluoride fibers (fluoroindate fibers) with improved infrared transmission at longer wavelengths. Fluoride fibers exhibit a high optical transparency at mid-infrared wavelengths, whereas the common silica fibers absorb light beyond ≈ 2 μm. Rare earth dopant ions in fluoride glasses as host media exhibit a strongly reduced tendency for quenching processes caused by multi-phonon transitions. Therefore, the lifetimes of various metastable electronic levels can be strongly increased compared with silica fibers, allowing the realization of certain lasers (see below). Compared with other fibers for mid-infrared transmission, fluoride fibers have a relatively low refractive index and low chromatic dispersion. The initially envisaged application of fluoride fibers was optical fiber communications, because the intrinsic losses of a mid-IR fiber could in principle be lower than those of silica fibers, which are transparent only up to ≈ 2 μm. However, such low losses as those of silica fibers have not been achieved in practice, and the brittleness and high cost of fluoride fibers also did not support a commercialization in this direction. Later, the utility of fluoride fibers for various other applications was discovered. The first group of these applications again exploits the mid-infrared transparency of fluoride glasses (→ mid-infrared fibers); examples are mid-infrared laser spectroscopy, fiber-optic sensors, thermometry, and imaging. Also, fluoride fibers can be used to transport light e.g. for Er:YAG lasers at 2.9 μm, as required for medical applications e.g. in ophthalmology and dentistry. In that area, there are also oxide fibers as a possible alternative, in particular germanate glasses, which also contain heavy metals. On the other hand, the largely suppressed multi-phonon transitions in fluoride glasses are very important for the realization of various kinds of fiber lasers and amplifiers, essentially because the upper-state lifetimes of various rare earth dopants become long enough for various laser transitions, particularly in upconversion lasers. For example, thulium-doped fluoride fibers can be used for blue upconversion lasers [6, 13, 14], and erbium-doped fluoride fibers for green upconversion lasers . Praseodymium-doped fluoride fibers can be used in 1.3-μm amplifiers  and also for visible fiber lasers with red, orange, green or blue emission [3, 8, 10]. Erbium-doped fluoride glass can be used for realizing 3-μm fiber lasers , and also 1.5-μm amplifiers with a wider and flatter gain compared with that of silica-based erbium-doped fiber amplifiers (EDFAs) . It is also possible to combine silica-based and fluoride fibers. Some fluoride fibers are used for supercontinuum generation in the mid-infrared region, reaching out to wavelengths of several micrometers . Again, the good infrared transmission resulting from the low phonon energy is the key to those achievements, but a suitable location of the zero dispersion wavelength is also important. Problems with fluoride fibers are that they are often (but not always) expensive and difficult to handle due to their fragility (not allowing, e.g., strong bending) and (partly) limited chemical stability. Typically, they are hygroscopic.